Film-Arcade.net: RDM Productions Announces "Don't Look in the Basement 2"
RDM Productions Announces "Don't Look in the Basement 2"
RDM Productions recently announced the sequel to the 1973 Classic Horror Film "Don't Look in the Basement". 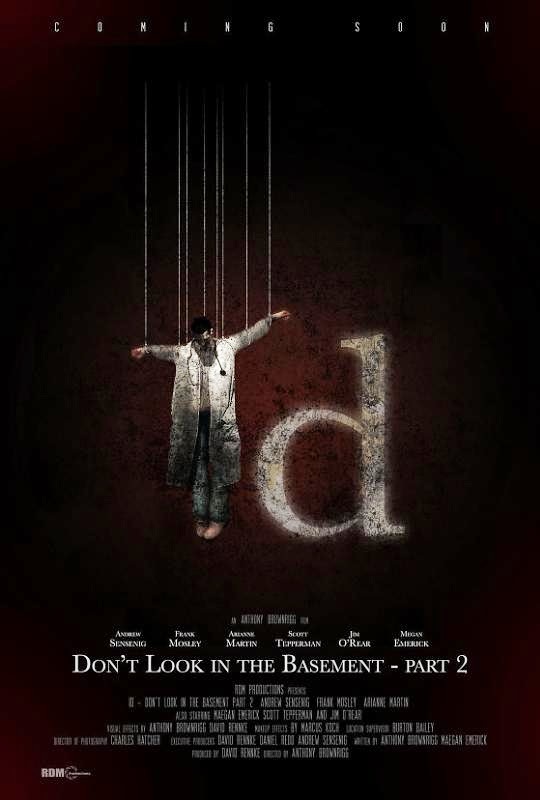 "Don't Look in the Basement 2" is being directed by Anthony Brownrigg, who is the son of S.F Brownrigg (Don't Look in the Basement"). The film is expected to be released later this year. For more information on this film. you can visit the film's official website at: http://www.dontlookinthebasement.com. RDM Production and id: Don't Look in the Basement 2, LLC, team up with Anthony Brownrigg to bring a sequel to his father's 1973 classic horror "Don't Look in the Basement" to life. S.F. Brownrigg, is one of the unsung heroes of drive in horror. His first film Don't Look in the Basement was a theatrical smash hit in the early seventies. And even today many horror director credit Brownrigg for inspiration when they began their careers. patients and doctors murdered, and one survivor, Sam, left alone with the bodies. Forty years later, Anthony Brownrigg, S.F. Brownriggs son and director of the award winning Red Victoria, has teamed up with David Rennke "Pearl" , Daniel Redd of RDM Productions, and Andrew Sensenig "Upstream Color" to bring a sequel to the long time favorite to the screen. The official trailer was released at Texas Frightmare Weekend Saturday May 3, 2014. While the specific plot has been kept tightly under wraps, the sequel revolves around what happened to the only surviving patient from the original film, and what happens when he is brought back to the original clinic where the murders occurred. "The film is more of a paranormal thriller than a drive in horror" says Brownrigg. "Dad wanted to produce a sequel in the eighties that revolved around the paranormal, and we took a lot of cues from what he wanted to do. It's bloody, for certain, but doesn't compete with the original." Many of the original cast, and crew are also involved in one way or another. Daniel Redds father Robert Redd, was the owner of PSI Film Labs that developed the film for the original. Camilla Carr, from the original cast has come back to play a different role in the sequel. And Jack Bennett II, son of effects artist Jack Bennett will join in through post production for visual effects. And even Libby Hall, mother of Anthony was known in the sixties for "The Naked Witch" a Larry Buchanan film, has come out of retirement to round out the cast. Andrew Sensenig "Upstream Color" will play the lead, along with Arianne Margot "Red Victoria, Other Side of Paradise", and Frank Mosley "Wuss, Upstream Color". Also cast are Earl Browning III, Jim O'Rear, Scott Tepperman , Megan Emerick and Willie Minor. The script was written by Anthony Brownrigg, and Megan Emerick, and the film will be shot on location at the original house used in the 1973 film located in Techuacana Texas. Principal photography ended in late April 2014 with an expected release later in the year.